Getting to know our couples. 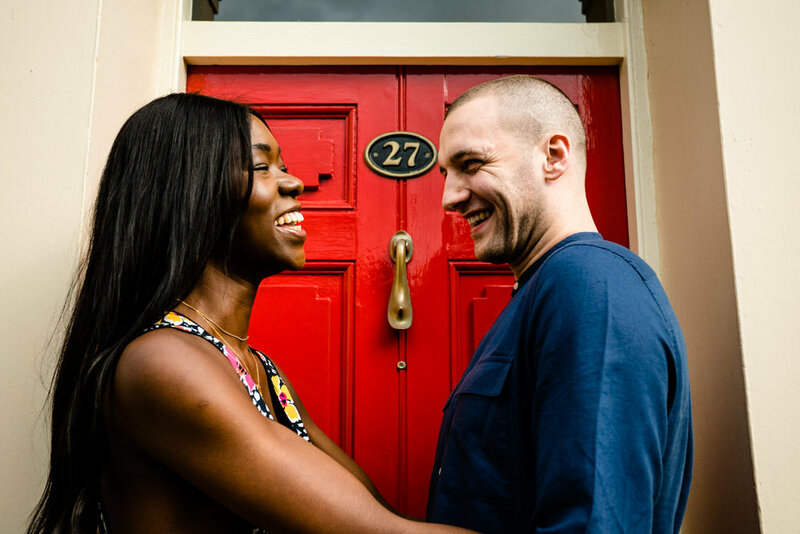 What we love about pre wedding shoots is getting the time to get to know our incredible couples a little better. 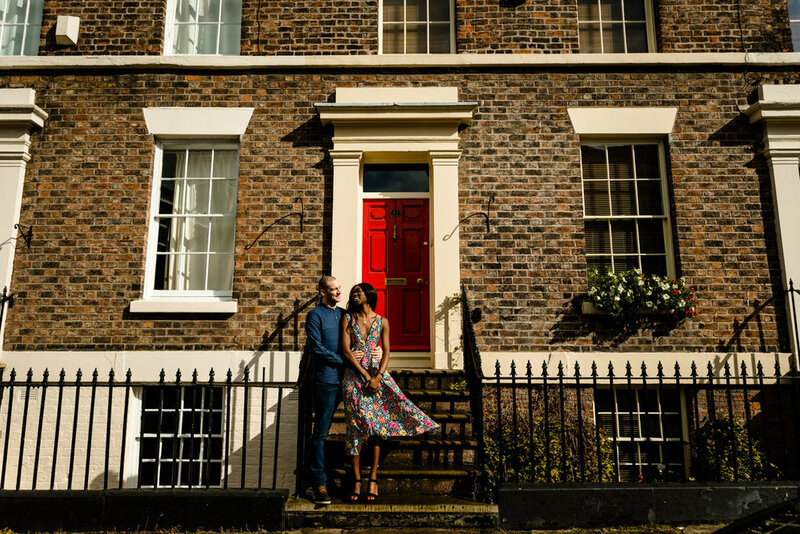 We met Flick and Will at a coffee shop on Hope Street in Liverpool, they have recently moved to Barcelona and so had flown over for a weekend of wedding planning. Unfortunately they couldn’t bring the Spanish sunshine with them and in typical Liverpool fashion it was pouring down outside. 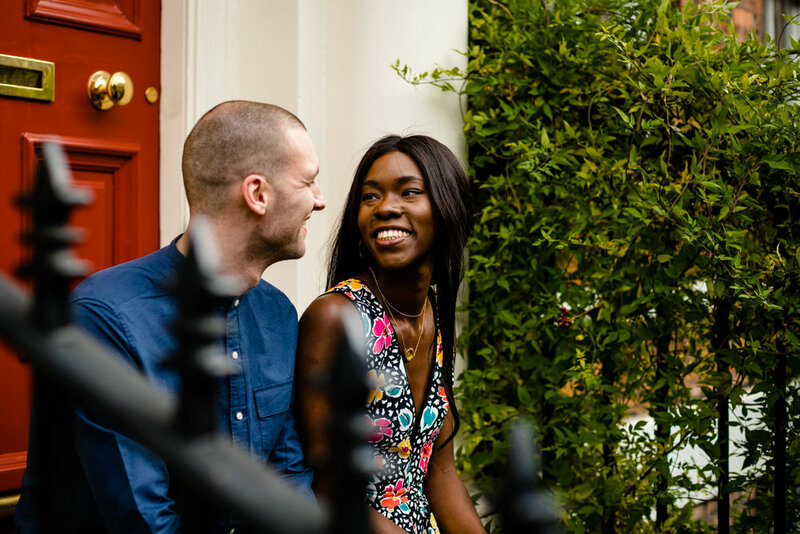 So whilst we waited for a break in the rain we worked our way through a couple of coffees and chatted about their wedding day plans, their new life in Barcelona, Will’s love of basketball and Flick’s love of fashion. We have been following Flick’s amazing wardrobe on Instagram (@blackankleboots) for a while and so couldn't wait to see what she had chosen to wear for the shoot. We loved her choice of a bright floral dress from Topshop, she looked stunning and it added the perfect pop of summer colour in what was a cold, autumn day. Colourful and creative pre wedding shoot. 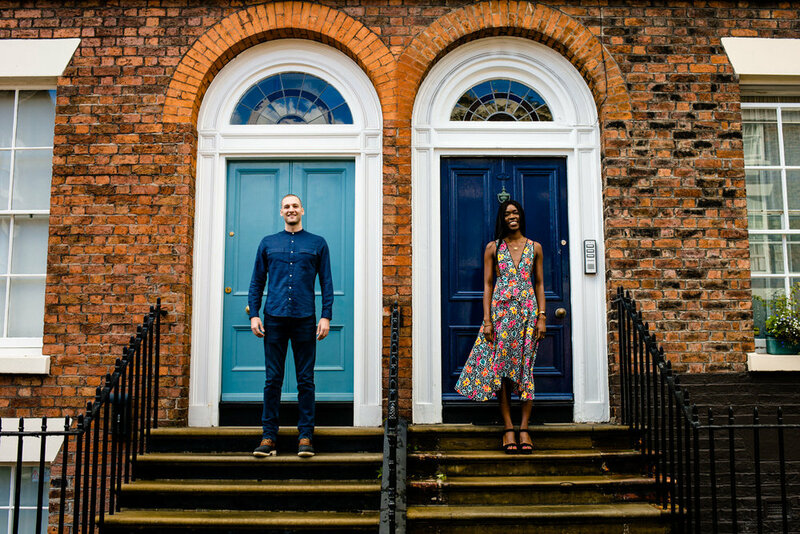 As you may have already noticed we love colour and we also love exploring the city landscape so The Georgian Quarter was a dream!! 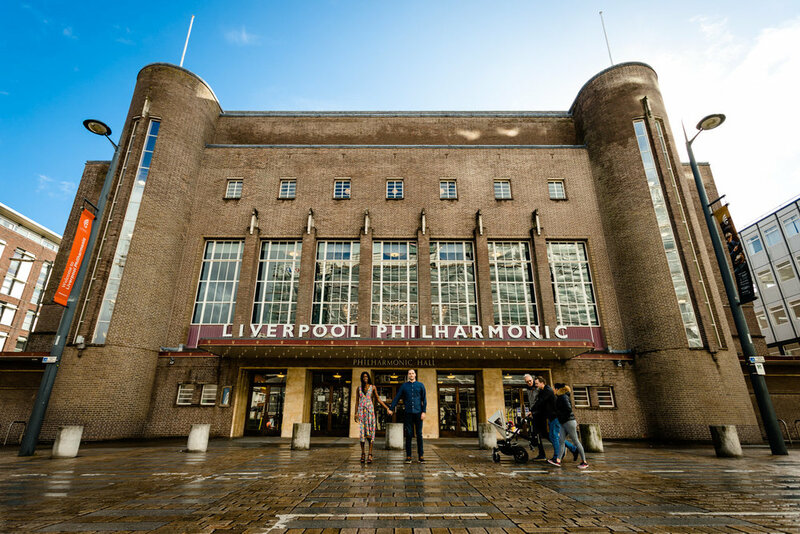 Flick and Will used to live in Liverpool and it was one of their favourite areas of the city and we are so glad they suggested it to us. The architecture is beautiful, we love the symmetry and elegance of the Georgian town houses and wide streets. And of course we couldn’t get enough of the brightly painted colourful doorways, they were everywhere! Flick and Will were great to shoot, they fed off our ideas and constantly laughed with each other. 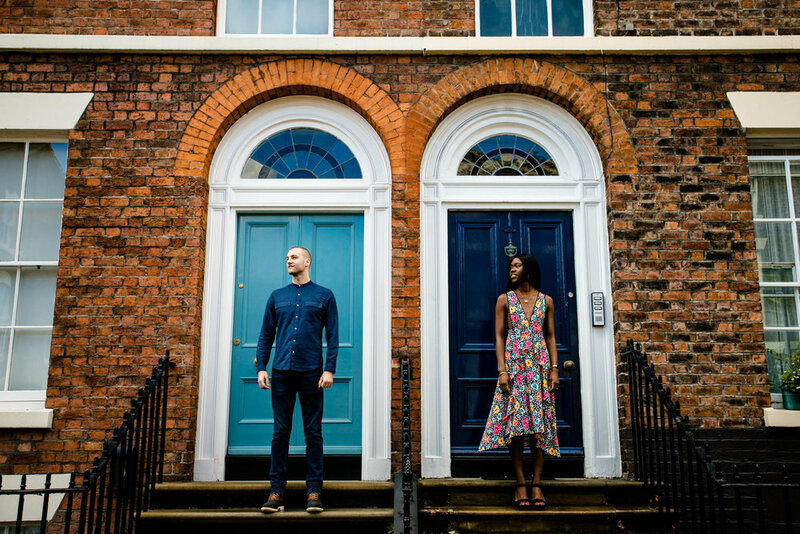 One thing we love about pre wedding shoots is it gives us more time and space to get creative and experiment with new ideas, which we can then use on wedding days too! 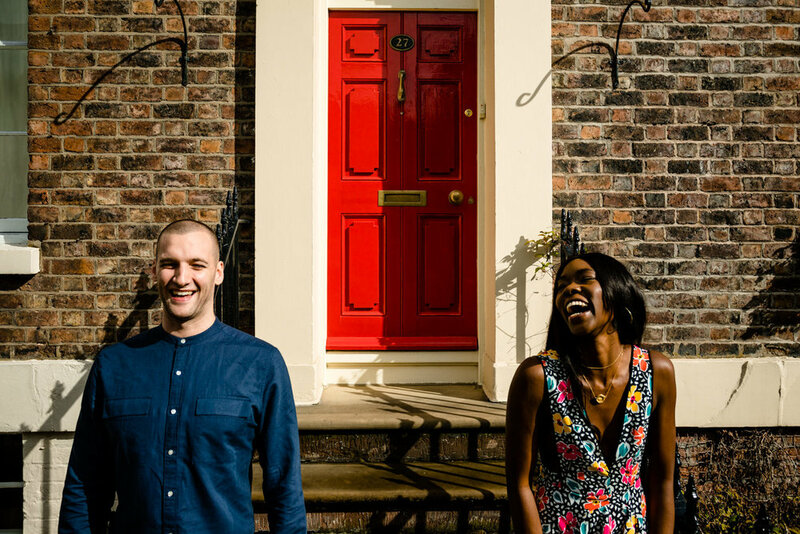 We cannot wait for Flick and Will’s wedding day at The Isla Gladstone in Liverpool. It is one of our favourite venues, the huge Victorian glasshouse is an amazing space for a party and offers incredible light throughout your day. You can see some photos from a previous wedding at the venue, Janice and Ryan’s day here. 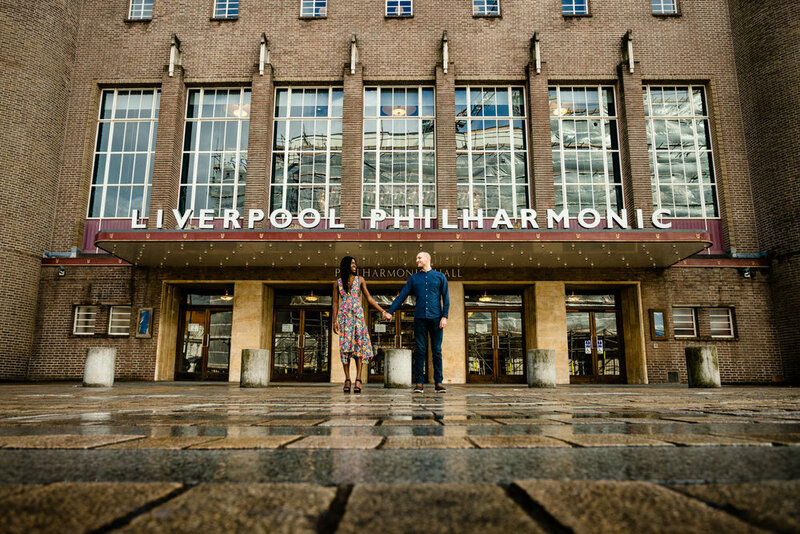 Alternative Wedding Venues in Liverpool. We are massive food lovers so we couldn't resist a post shoot lunch at one of our favourite food places nearby, the Baltic Market. It is an industrial space that has been transformed into food market packed with the most delicious and decadent street food vendors. (Plus it is dog friendly so great for Ripley!) It is in the cool industrial area of the Baltic Triangle which is filled with interesting and vibrant wall art and graffiti and is also home to some of our favourite alternative Liverpool wedding venues Constellations, Hinterlands, Sirenand Camp and Furnace which we can’t wait for a chance to shoot at!